WTF? Is this a window facing a backlot at Universal Studios? We’ve had monsoon-like rain around here lately, but I haven’t seen any snow yet. Or perhaps this is somewhere on the Tejon Pass, just barely within LA County and therefore technically “Los Angeles” even though it’s 40 miles from the actual city? Beats me. It’s a pretty picture, though. 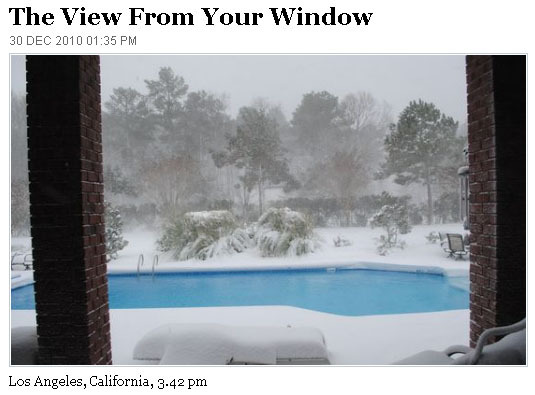 UPDATE: Turns out the picture is from Virginia Beach, not Los Angeles. Good to know that I’m not going crazy.